While legend places the martyrdom of St Paul near Rome, ancient tradition holds that his one-time traveling companion, St Barnabas (see Acts 11–15), became the first bishop of Milan and baptized the city’s first Christians. The story brings the New Testament in real time to the streets of Milan and predates the arrival of the relics of the Magi – the city’s other biblical claim – by some three centuries. While the presumed relics remain in Milan to this day, the legend of St Barnabas is widely regarded as a myth, and it is doubtful that the Apostle, whose feast day was celebrated this past week on June 11, ever set foot in the city. As with the relics of the Magi, the development of the Barnabas tradition is connected with Saint Eustorgio, the bishop of Milan (344–350 AD), who established a church foundation at the present site of the Basilica di Sant’Eustorgio, which is located on a cemetery dating to the third and fourth centuries and which coincides with the place where St Barnabas is said to have baptized the city’s first Christians. 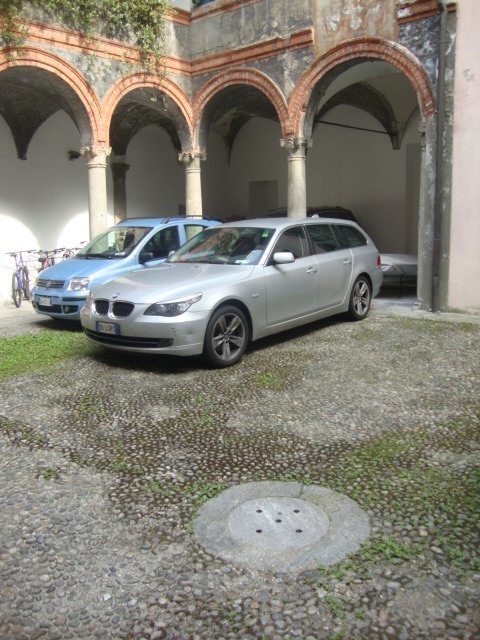 The topography corresponds to the location of an ancient stream where St Barnabas reputedly established Milan’s first baptism font, now located under the inner courtyard of a house on the southern side of the Piazza Sant’Eustorgio. 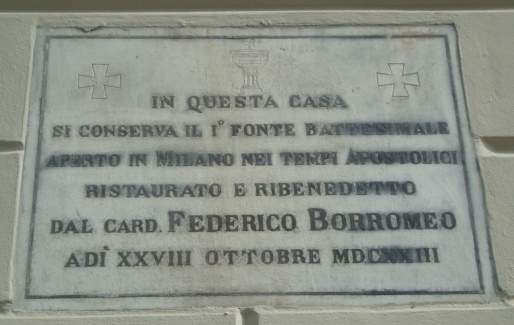 As still indicated on the façade of this house, on October 28, 1623, Cardinal Federico Borromeo restored and blessed this font, ensuring the survival of the Barnabas legend. 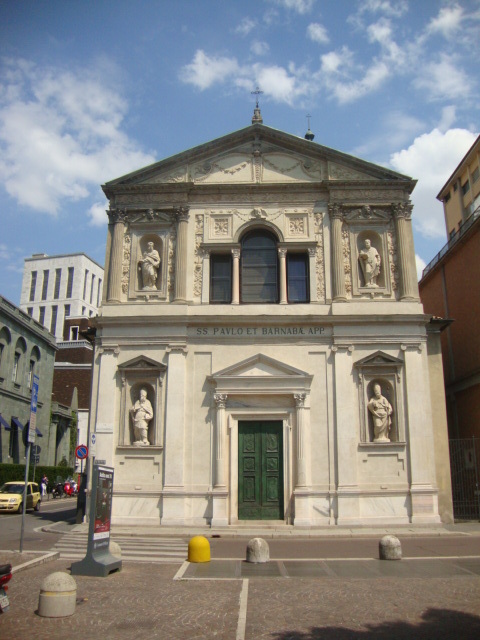 The Milanese commemoration of St Barnabas, the ‘son of encouragement’ (Acts 4:36), has also found expression in the city’s historic Church of St Paul and St Barnabas, which became the principal church for the Order of Barnabites, founded in 1530 by St Antony Zaccaria. St Barnabas’ role as the first bishop of Milan is not the only myth surrounding the apostolic saint. Tertullian wrongly identified Barnabas as the author of the New Testament book of Hebrews, and his authorship of the apocryphal texts, The Epistle of Barnabas, The Gospel of Barnabas, and The Acts of Barnabas, once espoused by the Early Church Fathers, has now been discredited. 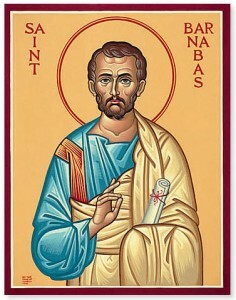 The Christian tradition more widely held than the Milanese version states that Barnabas, never a bishop, preached in Alexandria and Rome before being stoned to death at Salamis (Cyprus) about 61 AD, where he is still venerated as the patron saint of Cyprus. 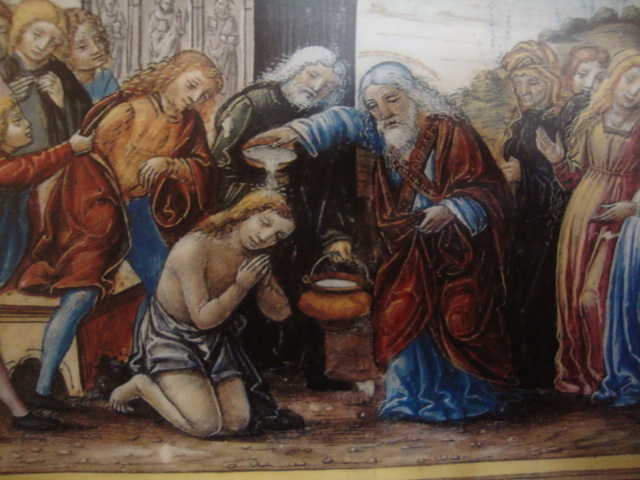 Legend depicts him anachronistically holding a copy of the Gospel of Matthew at the time of his death.